Our selection of Kenya Safari Lodges and Tented Camps classified in economy, standard and luxury options and distributed in National Parks, Game Reserves and Wildlife Sanctuaries. All listed accommodations units are sufficiently adequate, comfortable and are with private bathroom facilities. The standard of facilities comfort level and location do vary. 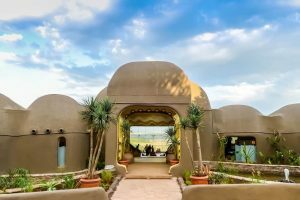 Located high on the slopes of the Oloolaimutia Hills, Masai Mara Sopa Lodge was one of the first safari lodges to be built in the Maasai Mara Game Reserve, a reason why its gardens and trees are so lush and mature. 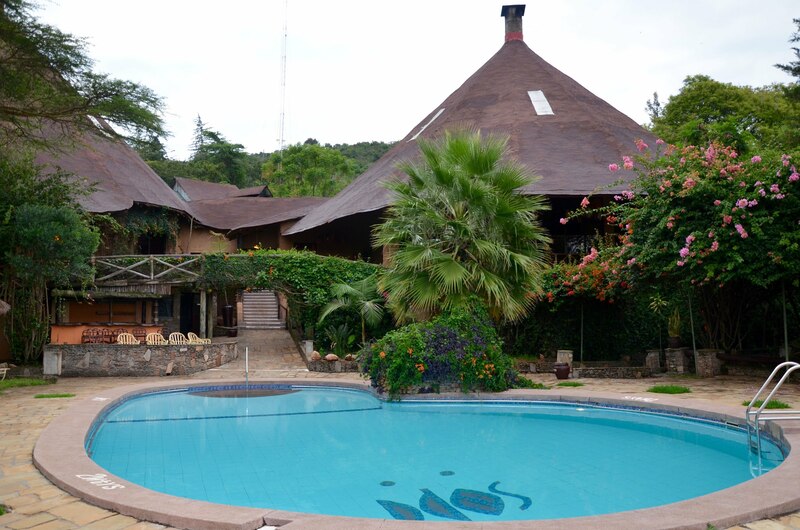 All the buildings follow the design of traditional African round houses with conical roofs, and these stretch along the line of the hills with the impressively large public area buildings and the swimming pool at their centre. Airy and spacious with an adjacent gift shop, the area – which incorporates a guest information desk – is decorated with warm earth colours and lit by an enormous, Afican calabash chandelier. This is located down a few carpeted steps from the reception, and is also accessed via convenient points from both guest accommodation wings. The large, comfortably furnished circular area has a massive central fireplace whose chimney soars twenty metres up to the top of the thatched conical roof. The walls and their murals are painted with a pleasant fusion of earthen colours to create an extremely warm ambience, and the room has a well appointed bar set to one side of it. Two doors access the sheltered but outdoor veranda with its views over the swimming pool, the gardens, and the game reserve beyond, and this is linked to the outdoor dining room patio by a bridge. It is also here that we provide complimentary afternoon tea or coffee together with sandwiches and cakes before your last game drive of the day. 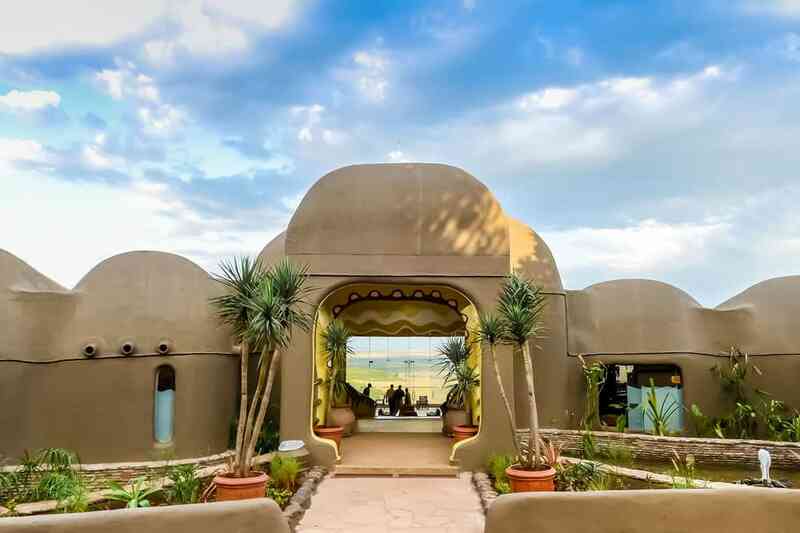 Over 700 square miles of lush, sun-drenched plains encircle Keekorok Lodge, the first property in the Masai Mara Game Reserve in southwest Kenya. The lodge was opened in 1962 and is ideally situated in the direct path of the spectacular animal migration that occurs every year from July to October. Guests can experience unparalleled safari adventures, morning and evening game drives are a must for anyone visiting the reserve. The quality of Keekorok’s dining options is unsurpassed, and you will be able to savour the Chef’s delicious creations for each meal during your stay at Keekorok Lodge. 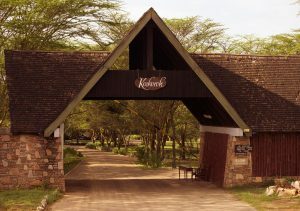 There are 85 Standard Rooms at Keekorok Lodge. Standard Rooms are 32sqm. The Standard rooms been furnished with carefully selected custom-made furnishings, that reflect the hotel’s quiet serenity. Rooms are authentically designed décor with perfect views of the Lawns and the Wild. 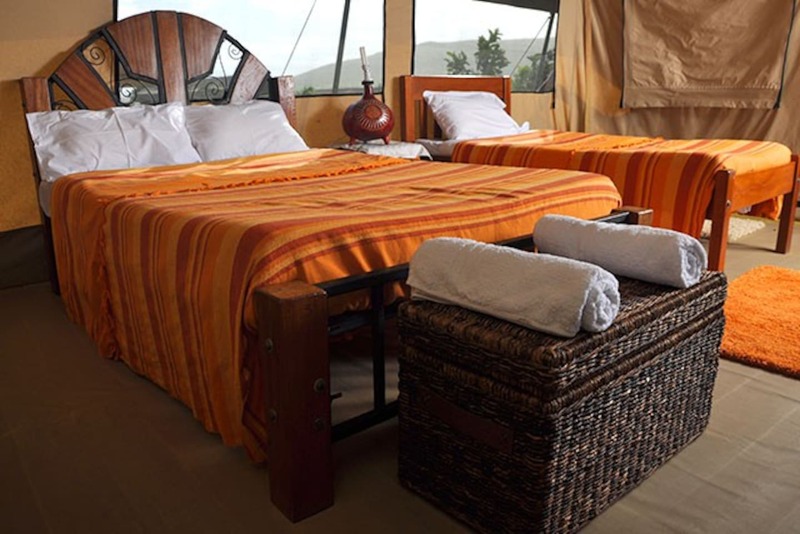 The twenty tents offer breathtaking views of the Mara plains, and are luxurious and extremely spacious, decorated in whites and soothing earthy colors with large beds, loungers, wardrobes and a desk. Bathrooms are appointed with his and her sinks and a bath in addition to the shower. Club tents have glass panel doors and a deck outside for game viewing and private dining. mini bar, hair drier, bath robes and slippers. he setting is magical. So much so that almost a century ago it was reserved, exclusively, for Kenya’s colonial Governors. 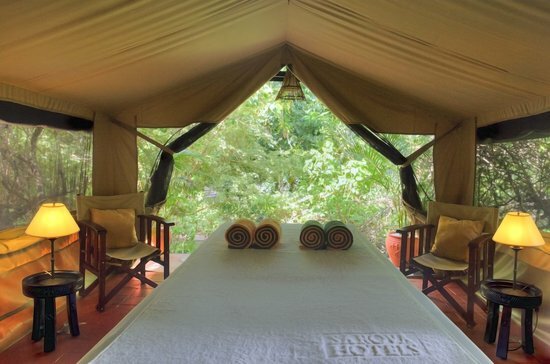 Governors’ Camp nestles in the forest along the winding banks of the Mara River, it’s waters teeming with bird-life, hippo and crocodile, in the heart of Kenya’s Masai Mara National Reserve. 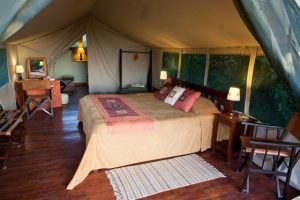 Some of the 37 tents line the riverbank, tucked into the forest they enjoy uninterrupted views over the Mara River, others have views across the sweeping plains of the Masai Mara. 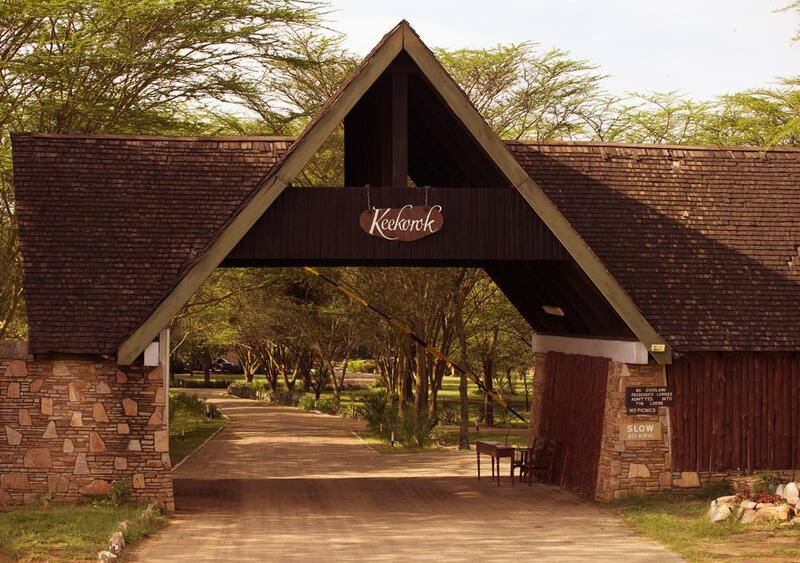 Created in 1972 Governors’ Camp set new standards in luxury for a tented camp. Today it’s still Africa’s best. Everything is under canvas, all tents have en-suit bathrooms with hot and cold running water and flushing toilets. 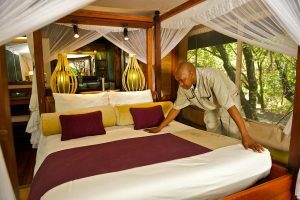 There is a bar tent with deck overlooking the Mara River and dinning tent with views over the plains. Governors Camp has just been awarded a Silver Eco Rating from Eco- Tourism Kenya due to our sustainable tourism practices in place in camp. The dining tent, campfire and the bar tent are the centre of the camp. Next to the reception is a small gallery with local paintings and handcrafts as well as a small souvenir shop. Breakfast and lunch are served buffet style, alfresco. Dinner is served in the dining tent. For dinner the menu offers a choice of four courses, including a choice of main courses. A traditional campfire is lit at sunset every evening and after dinner clients enjoy sitting around the campfire, reminiscing about their safari in its evocative light. Enkorok Mara Camp is set on 30 acres of private land in Masai Mara Siana’s Conservancy. The camp overlooks the scenic Oloolotikoshi Hills and the spot is perfect for sundowners for guests relaxing after a game drive with a captivating sunset. The Camp is set on the banks of Oloirigynyisho River where Zebras, Wildebeests, Elephants and other wildlife regularly come to drink water. Ololaimutia gate is located 2.5 Kms from the camp whilst the Keekorok Airstrip is 20kms and Sekenani Gate is 25Kms away. The spacious and airy Tamu Tamu restaurant serves delectable meals and is designed as an African Hut which is a place where families eat together. The circular design of the hut ensured that there was one focal point and people were close knit in the African culture. Our guests are family and the dining areas is an integral part of our camp where we eat together and chat about the days activities with our guests. Guests staying at the Camp can pick up give-away made by the local community as part of our social responsibility programme from the Zawadi Shop. 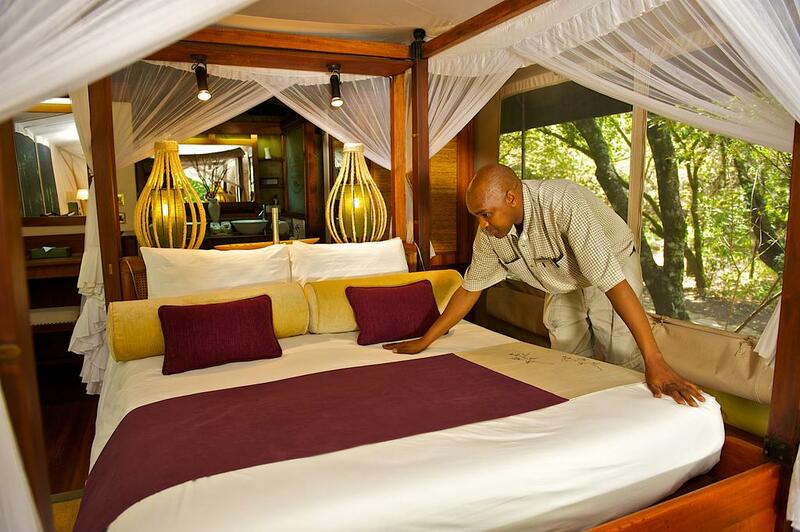 Enkorok Mara Camp is setting standards offering luxury services at affordable prices. Our friendly and professional staff are set out to send our guests back to their countries with great and lasting memories. Each of our 20 tents are set apart and linked by a paved walkway that winds through the unaltered local habitat. We also offer a variety of adventure activities such as walking safaris with the Maasais, Balloon Safaris as well as Day and Night Game Drives. 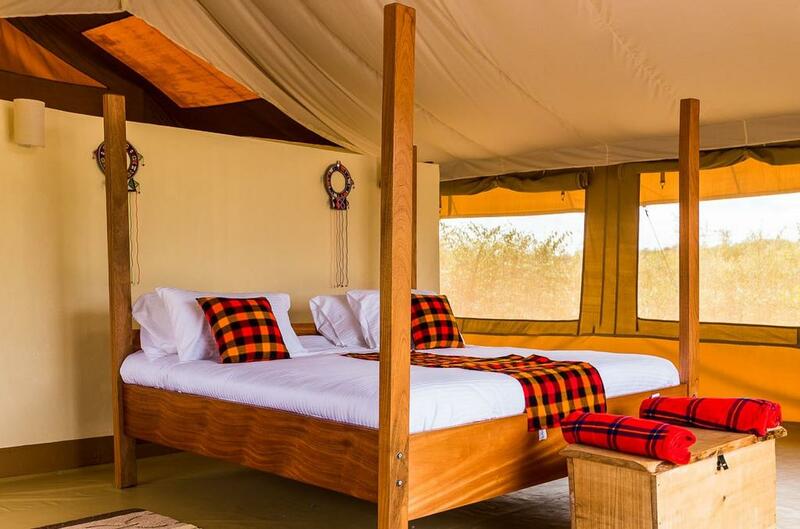 camp boasts luxury tents designed to meet all your needs and comforts in the wild.The Luxury walk-in tents are equipped with large comfortable beds, mosquito nets, clothes rack, carpet and writing desk. The en-suite bathrooms have a shower,a flush toilet and hand washbasin. 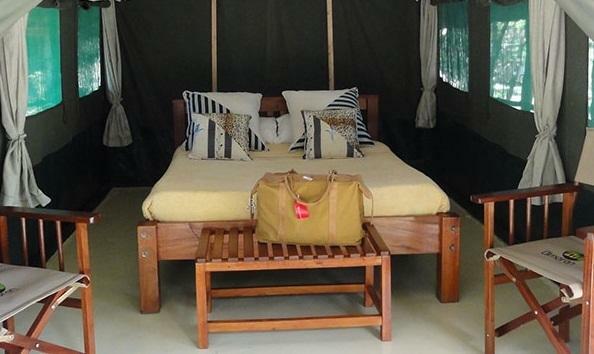 All tents have been placed far from each other to guarantee complete privacy and have a verandah with sun chairs.